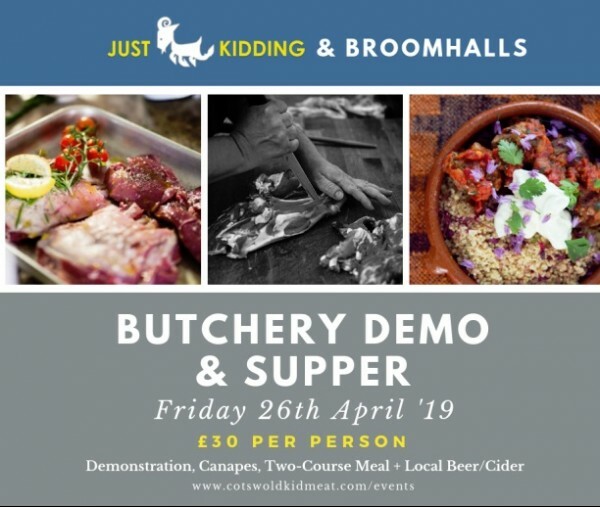 We’ve teamed up with Robert Reece of Broomhalls, to bring you a unique evening including a butchery demonstration and dinner. Supporting other local businesses has always been the key to the success of Just Kidding. We have worked with local family run abattoir, Broomhalls since 2013, ensuring that every step of the process is local and personally managed. Robert will lead the session, breaking down the art and science behind taking a finely-sourced animal from whole carcass to prime cuts, and beyond, with plenty of opportunities to ask questions. The demonstration will equip you with plenty of ideas and inspiration to cook kid meat at home. Meanwhile, we’ll prepare a delicious feast for you to enjoy after the demo. Price includes butchery demonstration, canapés, two-course meal and a local beer or cider. For all other drinks, it’s BYOB (Bring Your Own Booze). Doors will open at 6.45pm. Butchery demonstration starts at 7pm followed by dinner, with the event finishing at 10pm. Refunds - up to 14 days prior to the event.